Brussel sprouts are generally loved or loathed but I think this recipe will convert most haters fairly quickly. 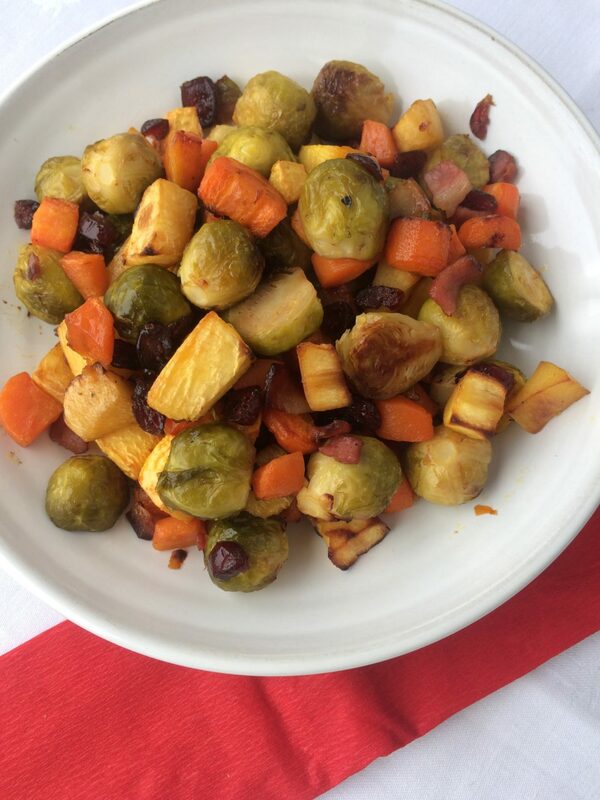 The secret is par-cooking the sprouts by blanching them for five minutes in boiling water followed by refreshing them in ice cold water so that they roast really quickly in the honey and cider sauce. Some pecan nuts would also be delicious added in with the bacon and cranberries to add a little Thanksgiving-esque touch to your Christmas dinner feast. I’ve used carrots and turnips here but parsnips, squash, sweet potato or any other root vegetable would also work great. Preheat an oven to 200°C/180°C fan/400°F. Melt the coconut oil in a large roasting tray. Once the coconut oil is melted, add the carrots and turnip and coat in the oil. Roast in the oven for 20 minutes or until soft through, stir regularly to ensure they evenly colour. Whilst the carrots roast, prepare the sprouts. Remove the outer leaves of the sprouts and rinse. Bring a large saucepan of water with the salt to the boil. Remove from the heat and add the sprouts. Allow to blanch with the lid on for 5 minutes before straining and refreshing under cold running water. Whisk the honey and vinegar together and stir through the sprouts, bacon and cranberries until well coated. Once the carrots and turnip are soft through, add the sprout mix and combine together. Increase the oven temperature to 220°C/200°C fan/425°F and return all the vegetables to the oven. Continue to roast for 10 minutes until crispy.